As translator and novelist Elliott Colla writes, Samih al-Qasim — who died on Tuesday — was identified primarily a poet. But he was also an essayist, a memoirist, and a letter-writer. 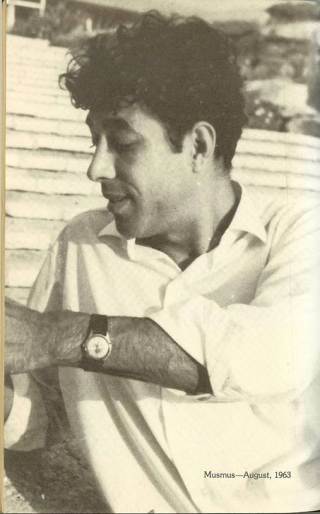 Colla has further shared a 1990 letter that al-Qasim addressed to the memory of the poet Rashid Hussein, a poet of such charm that Mahmoud Darwish called him “the star.” Hussein, however, didn’t have a charmed life, and he died tragically in 1977. Believe it or not, but after all this time separated from one another, you may find it hard to recognize me when you stand there on the station platform, waiting for me to arrive on the last train. And you, typical of you, will try to comfort me as I mourn your passing. O Rashid, you unhappy man, you most unlucky brother! On the thirteenth anniversary of the senseless event of your “having had enough,” I went to Musmus to pay you a visit. When you left us, I went to visit your mother. I nearly fainted when I saw her—she looked so much like my own mother! I am not talking about feelings or emotions, but a naked truth, a bare fact. For days, I was haunted by the terrifying fact of that visit. There is something else, too: I never elegized you. I do not even know how I was supposed compose such a poem. I want you to tell me the truth: would you be angry if I wrote an elegy for you, about you? Would you consider that an unfriendly gesture, and me, the kind of friend who believed in unsubstantiated rumors?